St Columba brought Christianity to Skye and the ruins of earlier churches are to be seen in and around Portree. The present building, designed by John Hay of Liverpool, was built as a Free Church in 1854, became the United Free Church in 1900 and the Church of Scotland in 1929. St Columba and St Taraglen are depicted in stained glass windows. Other windows by Douglas Hamilton and Thomas Webster. 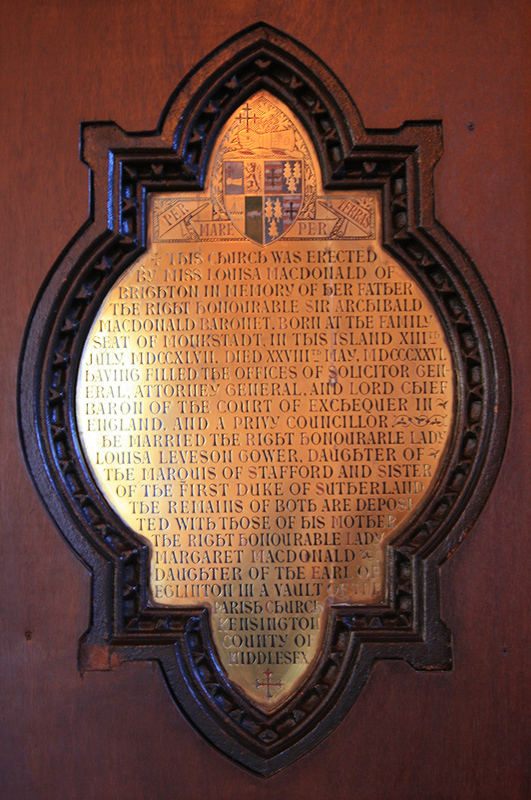 “This church was erected by Miss Louisa MacDonald of Brighton in memory of her father the Right Honourable Sir Archibald MacDonald Baronet. Born at the family seat of Monkstadt, in this island, 13 July 1747. Died 28 May 1826 having filled the offices of Solicitor General, Attorney General, and Lord Chief Baron of the Court of Exchequer in England and a Privy Councillor.